MRS BROWN’S BOYS was the most-watched television programme on RTÉ on Christmas Day, the broadcaster has revealed. 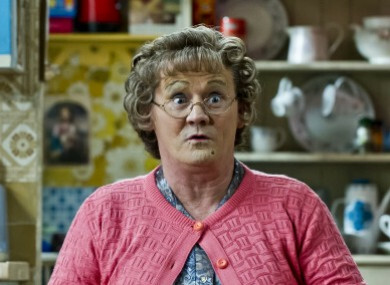 This year’s special, Mrs Brown’s Boys – Exotic Mammy, was watched by an average audience of 612,000 viewers, earning it a 41% share of the market at the time it aired. It is the eighth year in a row that the sitcom has topped RTÉ’s Christmas Day ratings, although the audience represents a drop of more than a third from its 2012 peak, when 972,000 viewers tuned in. The Young Offenders seasonal special was the broadcaster’s second most-watched show on 25 December, with with 480,000 average viewers and 36% share. It has also been streamed over 18,000 times to date on the RTÉ Player. In third, an hour-long Fair City special on Christmas Day was watched by an average audience of 349,000. Meanwhile, the broadcaster also revealed that its most-watched Christmas Day movie was Home Alone. That was followed by The Jungle Book, with Star Wars: The Force Awakens and The Magnificent Seven also faring well with audiences. RTÉ added that a festive Late Late Show which aired last Friday and two episodes of the news also featured in the top five programmes to broadcast between 21 and 26 December. Email “Over 600,000 tune in as Mrs Brown's Boys tops RTÉ Christmas ratings for eighth year in a row”. Feedback on “Over 600,000 tune in as Mrs Brown's Boys tops RTÉ Christmas ratings for eighth year in a row”.